It was just a few short weeks ago that the Nanooks and Lakers faced each other for the first time this season, where the Nanooks got not only their first win of the year, but the first sweep (albeit with an official tie). Since then they’ve split with Alabama-Huntsville, were swept against Michigan Tech and swept Ferris State. Last week against the Bulldogs marked the start of a three week stretch for the Nanooks of home games before travelling back south to Bemidji. The top three scorers consist of Steven Jandric, Colton Leiter and Chris Jandric, all of whom have 10 points each, with Jandric having 3 game winning goals. Junior netminder Anton Martinsson has started in 10 of Alaska’s 18 games, losing all but two of them, with the two being ties. Freshman Gustavs Grigals has given them all four of their straight wins. In the last two series, the Lakers have won 1 of 4 games, that being against U.P rivals Northern Michigan, where they currently lead in goal differential of +1, with the Cappo Cup series currently tied, and won’t reach it’s conclusion until the second to last series in February. Last weekend’s series against #3 Minnesota-State Mankato went about how I expected, a sweep in favor of the Mavericks. They’re playing at a completely different level than the rest of the league (without having seen Tech play yet), and certainly deserve to be in consideration for #1 in the country. Nellis, Cuglietta and Torrel still lead the team in scoring, with Anthony Nellis running away with 15 points. Colin Saccoman and Jacob Nordqvist earned WCHA honors for November, those being Defenseman of the Month and Rookie of the Month respectively. Saccoman is certainly an important piece on the Laker’s backend. 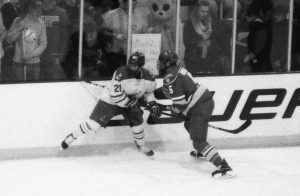 Nordqvist, a freshman defenseman, is looking to be that next anchor piece on the blueline after Sacco. Congrats to those two! In goal, Kossoff has pretty much run away with the starter, having a 5-2-1 record compared to Mitens 2-4-0 record. There will be a lot for the Lakers to deal with this week: Travelling across the country, the jetlag, maybe actual polar bears and moose. But the Carlson Center features an Olympic sized sheet of ice. With our slate of international players, managing this should be easier than it has in the past, as most international leagues use the large sheet. The games this weekend start at 11:07pm local time, or 7:07pm Alaska time. 99.5 YesFM will have a feed, both locally over the air and online at YesFM.net and on TuneIn. I am not sure if it will be Bill Crawford, Matt Pocket or if we will be hearing Alaska’s feed like we normally do. And like every weekend, FloHockey, the official streaming service of the WCHA will be carrying the game. As of now, I am unaware of any viewing parties, probably due to the late start time.